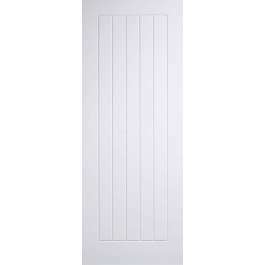 35mm engineered solid core two panel non-fire rated internal white primed door with 5mm vertical v-grooves. Supplied double primed in white, ready for on site-finishing. Available in standard imperial sizes with 10 years manufacturing guarantee. Classic interior door featuring long vertical panels, double coated in white primer and ready for the final coat of paint to be applied on-site. Matching glass and fire door available.